LIMA, Peru (CNN) -- Venezuela has blasted Peru's granting of political asylum to a Venezuelan politician wanted on corruption charges. "Despite the amount of evidence, the Peruvian government decided to grant Manuel Rosales political asylum," Venezuela's government said in a statement Monday. "It's a decision that thwarts international law, inflicts a blow to the fight against corruption and is an affront to the people of Venezuela." 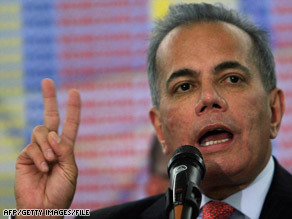 Asylum was granted to Rosales -- the mayor of Maracaibo, Venezuela -- on humanitarian grounds, Peru's foreign minister said earlier Monday. Rosales, a leading political opponent who lost the 2006 Venezuelan presidential race to Hugo Chavez, faces charges of illegally enriching himself while governor of Zulia state. He was scheduled to turn himself in last week but instead fled to Peru. Peruvian Foreign Minister Jose Antonio Garcia Belaunde said that recent statements by Rosales against Venezuelan President Hugo Chavez were not taken into account in his asylum case, the state-run Andina news agency said. Rosales denies the corruption allegations against him, saying Chavez is persecuting him. In last month's interview, Rosales called the charges that he had illegally accepted money "totally false" and said he not only declared all of his income, but paid taxes on it. Rosales called the district attorney's actions "a manipulation" and said the prosecutor "is acting on Chavez's orders."